Kate over at The Clean Plate Club has come up with a great monthly event–one that combines my love for cookies with my equally passionate love for carnie rides! 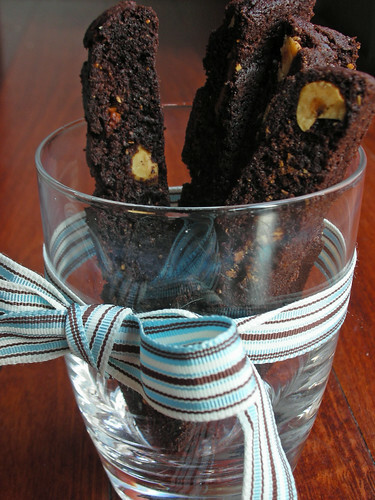 The price of admission to this month’s Cookie Carnival is a batch of chocolate-hazelnut biscotti. There’s been a lot of chocolate and hazelnut here this month, hasn’t there? Well, that’s OK–it’s one of my favorite combos, so keep it coming! A café cookie jar staple, we all know biscotti as the crunchy biscuits we dip in our lattes. They are “twice baked” to get that hard crunch…first a large log to set the dough, and then again when that dough is sliced into individual cookies. Besides the fact that I made just one-quarter of the full recipe, I did substitute white chocolate chunks for the semisweet chips. I figured that since the biscotti have a dark cocoa base, the white chocolate would go nicely. And, as a result of some shopping confusion, I have a giant bag of white chocolate pistoles that I’m itching to use up. A couple of months ago I bought a one kilo bag of the stuff for the DB opera cake. It should have been fairly obvious that there was no way I’d need that much, but for some reason my brain sometimes chooses to sit out the decision-making process.. These biscotti were good. I wasn’t crazy about them when they were fresh put of the oven, but they were much improved after sitting around for a few hours, I thought, and quite perfect when dunked into coffee the next morning. That being said, while I am glad I made them, I probably won’t make them again…but only because there are just too many other cookies out there to try! -Preheat oven to 350°F. Line heavy large baking sheet with parchment paper. -Grind 1/2 cup toasted hazelnuts in processor. Set aside. Whisk flour, cocoa, baking soda, baking powder and salt in large bowl. -Beat butter and sugar in another large bowl to blend. Add eggs and vanilla and almond extracts and beat until well blended. Beat in flour mixture. Mix in 1 cup whole toasted hazelnuts, chocolate chips and 1/2 cup ground hazelnuts. -Divide dough into 2 equal pieces. Shape each piece on baking sheet into 2 1/2-inch-wide by 14-inch-long log. Place logs on prepared baking sheet, spacing 2 1/2 inches apart (logs will spread during baking). Bake until logs feel firm when tops are gently pressed, about 35 minutes. -Cool logs on baking sheet 15 minutes. Maintain oven temperature. -Using long wide spatula, transfer baked logs to cutting board. Using serrated knife, cut warm logs crosswise into 1/2-inch-thick slices. I thought they were delicious too, although we sent the majority of them overseas. I love your pictures, especially the ribbon. very pretty. Mmmmm, these would go fabulously with the coffee I’m drinking right now! Oooh, such a classic, delicious cookie! I made mine with almonds. These were really tasty. I actually did like them slightly warm before the second bake. They were a little brownie-like. Yours look lovely! 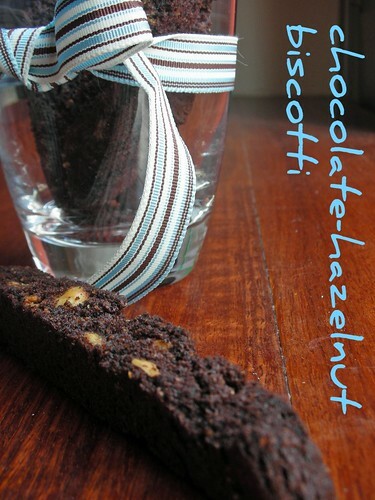 I have been looking for a good biscotti recipe! And I really wanted one that included chocolate. I think I’ve found it! they look fabulous! stunning photo as usual. love it! I’ve just discovered your blog… beautiful! Lovely choice for the carnival. I love biscotti! I’m sorry I missed out on making biscotti this time around, as I’ve never made it before. Like the addition of white chocolate seems perfect, great color contrast! Great job! And your photos are AMAZING! they look fabulously delicious, great job! Your cookies look great. I like your suggestion of using white chocolate instead of the semisweet. Love the bow by the way. Great color combo!